What transpired between Jim Acosta and President Trump during today’s 87-minute press briefing was apparently the tipping point for the Trump administration because they have officially banned CNN’s chief White House correspondent from entering the White House grounds. 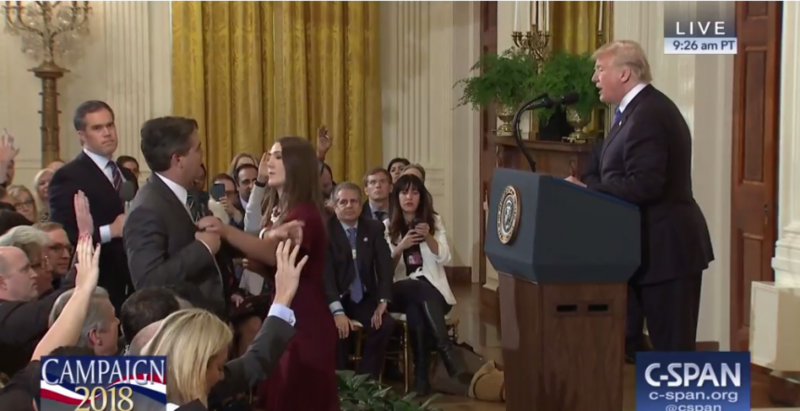 At one point during the contentious back and forth between Acosta and Trump, an intern came towards Acosta. It appeared that she tried to grab the mic from him. Acosta struggled to keep it, and she moved away. The woman returned seconds later and he released the mic, which she then gave to NBC’s Peter Alexander. News the White House pulled Jim @Acosta’s credentials is not an attack on one journalist but all of the press. There should be complete solidarity. This is a moment for any Republican who says they believe in the Constitution to stand up. I worked with Jim @Acosta during my years @CNN. He’s dogged and determined and a credit to his profession. His job is to hold power to account, not to be “nice” to the President or anyone else he covers.